In a bid to get into the carnival spirit during Liverpool’s Brazilica Fest this year, two year old Primo and I went for lunch at Viva Brazil – our first experience of authentic Brazilian food. We headed to historic Castle Street, where the stylish Brazilian restaurant is decorated sympathetically with the original features of the former 19th century bank building in what was once exclusively Liverpool’s commercial district. Blues and aquamarine, gilt coving, and wood panelling. No gimmicky stuff here; all very tasteful and grown up. I always feel a little bit proud of myself when I try something new, so I’m not sure why I don’t do it more often! Relying on the familiar can be a bit of a cop out, although there’s often a reason for it – you know what you’re getting and don’t waste your time or money. Viva Brazil was a good use of both, and I couldn’t believe I’d never been before. The friendly staff explained the rodizio style of service really well – they didn’t assume prior knowledge or patronise me – so I was relaxed and happy straight away. Once shown the ropes, I was let loose on a massive choice of skewered meats, all delivered churrascaria style to the table and carved off for us. The servers wear suede aprons and circulate throughout the restaurant bringing a selection of skewers to choose from. I was in my element, and rodizio sounds so much more exotic than All You Can Eat. The salad bar too was traditional Brazilian accompaniments – rice and green bean salads, broccoli pie, cheese, and fresh fruit. There are seafood and vegetarian options but I went straight for the meat eaters selection. If you’re not feeling very adventurous then the Costela de boi (beef rib) and Cordeiro (lamb) are not a million miles away from the type of thing you’d get in a really good roast – think of your mums best Sunday dinner x a really great carvery and you’re somewhere there. If you want something even more authentic Brazilian have a go of the chicken hearts and cinnamon pineapple. In between there’s loads of lovely seasoned steaks to choose from as well as chicken wrapped in bacon, and Brazilian sausage. I pride myself on being able to do ‘All You Can Eat‘ restaurants some real justice, but I really met my match at Viva Brazil. It’s definitely good value for money, and I saw some men twice my size visibly written off from filling their boots. But if you still think you can give Man Vs Food a run for his money then you don’t have to stop after tasting each skewer; the servers just keep coming and coming until you are sure you don’t want any more. I ordered the crushed fish goujons for Primo which were ridiculously soft on the inside – you know like the softness of frozen fish fingers? But these actually taste of real fish. From the real sea. Not the Birdseye factory. They were coated in seasoned breadcrumbs and with a light mayo and dill dip which I adored but Lord Fusspot just wouldn’t entertain because it doesn’t begin with “ketch” and end in “up“. Served with fries, the meal was much more than a teeny toddler with the appetite of a sparrow could handle, but would be perfect for older children who don’t want to go for the full blown meat experience straight from the skewers. The best thing though, is that kids up to the age of 10 eat free with a paying adult. As well as the fab food and friendly service, I think the main thing for me was the relaxed atmosphere. 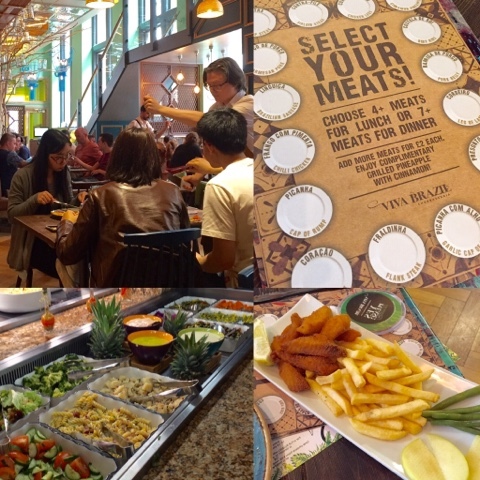 Sometimes with an All You Can Eat or buffet set up, you can be made to feel like you’re on a time limit but we weren’t rushed at all and the music and ambience made it the perfect lunchtime oasis on a lively Saturday in central Liverpool. I had a good nose at the other customers and was pleased to spot some Real Life Brazilians (always a good sign! ), as well as families with kids of all ages, couples, a group of lads in their 20s, two elegant ladies who lunch in their 50s (sorry girls – 40s? ), Japanese tourists taking pictures of everything, and some body builders having a total protein fest. Perfect for mates dates or family meals for lunch or dinner – my only tip would be go there AFTER your shopping trip, otherwise you won’t be able to do any zips up in the changing rooms!